Well, if you're referring to the retail in 220, that's like 15k sqFt. I think JEA needs like 200k sqFt. Not sure what else you're referring to in Brooklyn as the Fresh Market center is 100% leased, and between Vista and Brooklyn Place they're building two more center. Nine Floors of the JEA Tower flooded over the weekend. Looks like it's business as usual as it only affected the break room areas. Yikes! They must be itching to get out of there. On Monday, JEA says a water supply line to the ice machine on the 14th floor failed, flooding that break room and surrounding areas. JEA says that leak caused damage to the 12th floor as well, although it appears the 13th floor was spared. So much for 13 being unlucky. The 13th Floor was protected by the Interdimensional Demons, as all 13th floors are Interdimensional Portals. Haha - apparently the writer of the story has never been in a building larger than 12 stories. Side note: These three things happening within days of each other seems uncanny....or they literally don't maintain anything. A Water heater going bad isn't a building structural issue. I suppose the line to the ice maker could have been....or a rubber hose just gave out. The third thing seems like nothing. The costs associated with Cordish's potential 200,000 square foot, Class-A, Beyer Blinder & Belle designed JEA headquarters at Lot J aren't being released to the public, but for what it's worth, Cordish's recently announced 200,000 square foot, Class-A, Beyer Blinder & Belle designed Pattison Place at Xfinity Live! in Philadelphia is estimated to cost $80 million. Similar design, with but 20,000 square feet of ground-floor retail, which the JEA proposal doesn't include. I'm sure Philly has union expenses that we wouldn't, but we'll have remediation expenses on our end as well. Here's a look at the hot new urban disrict emerging around Xfinity Live! What's interesting to note is that even though Pattison Place is next door to a major transit station and adjacent to the home of the NFL's Eagles, the NHL's Flyers, the NBA's Sixers, and the MLB's Phillies, the office space isn't being built speculatively. 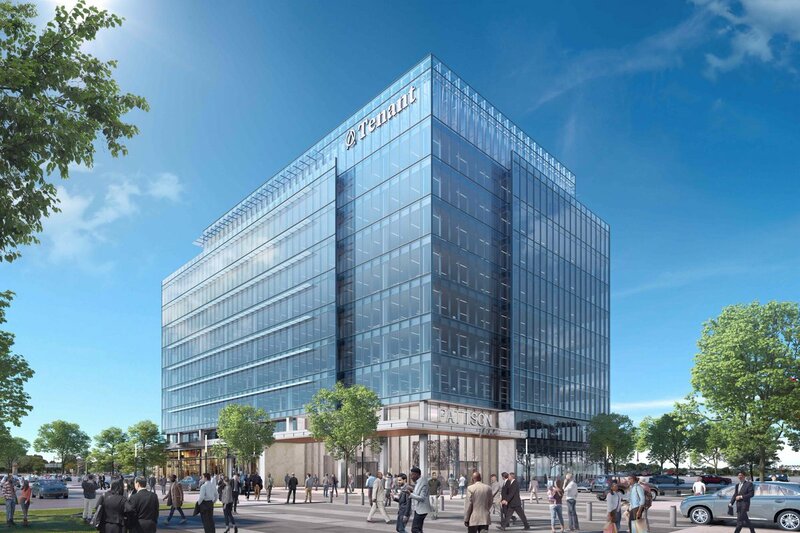 Cordish has stated that no construction will begin on Pattison Place until a certain percentage of the office space is pre-leased. Could likely be a sign of things to come in Jax if JEA doesn't happen at Lot J.
I heard from someone at JEA today that there's a chance the decision might get punted again from early April. I've heard from multiple other people over there that the employees don't want Lot J, but feel like it's likely going to happen. ^What do employees want and why? Any idea how the transit dependent who need to pay electric bills at the last minute are going to access this place if it ends up at Lot J? Any idea how the transit dependent who need to pay electric bills at the last minute are going to access this place if it ends up at Lot J? If the Curry administration is anything like my dad, they'll be told that they should pay online and not bother trying to go to a physical place. Hahaha, that works until you encounter residents who can't afford phones, computers, etc. and those that don't have bank accounts to be able the pay online. At that point, you'd possibly have a discrimination suit on your hands. Those Philly parking lots make me want to cry. It's clearly a place in Philly that you don't go to unless you're in that specific area to catch a game. There's some support for Lot J, but the majority opinion seems to be a desire to "stay downtown." Like the Downtown Vision survey suggests, 90% of downtown workers enjoy working downtown, and it doesn't sound like the average JEA employee considers Lot J to be a part of downtown proper. Very few JEA employees have any more information about the headquarters decision than the general public does. Employees were given the same public information packets for the three options as everyone else. There are some people at JEA who absolutely want to close the customer care center, but the idea is 100% off the table. Wherever they end up, there's going to be a walk-in component. For context, the current JEA headquarters is a six-block, .25 mile round trip walk from Rosa Parks. If JEA moves to Lot J, the customer care center will be a 50-block, 4.5 mile round trip walk from the JRTC. Interestingly, the Kings Ave Group is pushing hard on Social Media. Not sure that will matter, but I find that interesting. I'll be disappointed if this is the site, but not nearly as disappointed as Lot J.